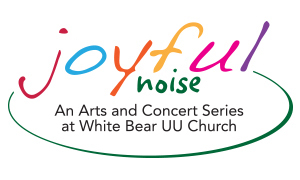 Joyful Noise is an arts and concert series from White Bear UU Church. Visiting musicians have called it “intimate, and a wonderful space to perform.” Joyful Noise concerts benefit the work and programs of White Bear Unitarian Universalist Church and support artists bringing diverse and powerful music expression to the world. Tickets for Joyful Noise events can be purchased at the church on Sundays and online via Eventbrite.